How to Delete Photos Pictures from iPhone XS Max/XS/XR/X/8/7 etc Quickly? How to Delete Photos Pictures from iPhone XS Max/XS/XR/X/8/7 etc? 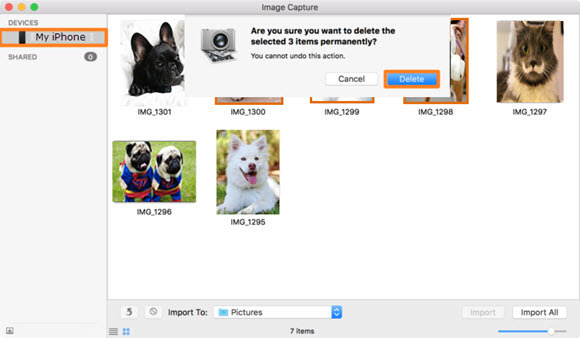 DearMob iPhone Manager comes out as the professional tool offering solution to how to bulk delete photos from iPhone iPad in seconds with fast speed, plus transfer pictures between iPhone iPad and computer, and backup iPhone iPad photos to PC/Mac securely. 1. Open the Photos app and go to the Album tab. 2. Open the Recently Deleted album and tap Select. 3. Tap each photo or choose several photos that you want to permanently delete. 4. Tap Delete to delete photos from iPhone forever. 1. To prevent mistakenly deleting photos from iPhone that you still need, you'd better backup iPhone photos to computer first via third-party tool but not iCloud as when you use iCloud Photo Library and delete a photo on one device, it delete on your other devices. 2. If you add photos to your iPhone, iPad or iPod touch from iTunes or third-party software, you can't delete the synced photos directly from your device in the Photos app directly. It is quite convenient to delete a few numbers of photos or pictures from iPhone via Photos app if you are only having your iPhone with you. However, it will spend you much time to take a lot of the tapping process when there are hundreds or thousands of iPhone photos to be deleted. 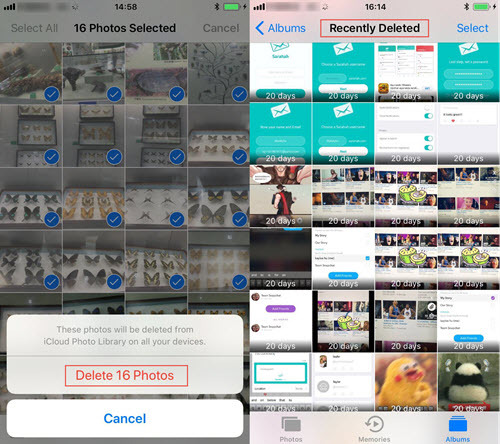 So, DearMob iPhone Manager is here to do you a favor in case that you need this kind of way to delete unwanted iPhone photos in one quick purge. Step 1. Get DearMob iPhone Manager. Click the download button below to free download DearMob iPhone Manager, install and launch it on your Mac. Use original Apple USB cable to connect your iPhone to computer, tap Trust This Computer to continue if there is a message popping up on your iPhone. 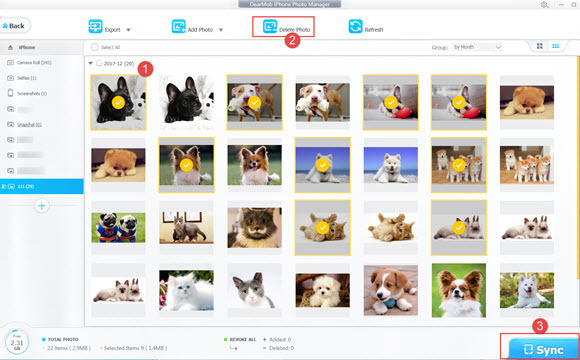 Once connected, you will access the main UI of DearMob iPhone Manager, choose the photos you want to delete without limits and then click on Delete Photo button on the top bar. And then click Sync button to finish removing photos from iPhone permanently. 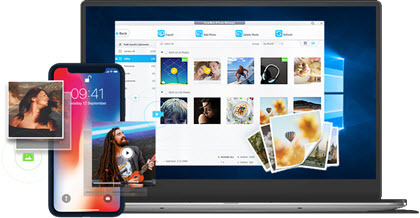 Notice: DearMob iPhone Manager only allows you to bulk delete iPhone photos imported by itself and synced from iTunes on Windows PC at present, but it gives you great convenience to export photos from iPhone to Windows 10 for backup and transfer pictures from PC to iPhone by just drag'n drop. If you'd like to delete pictures in Cameral Roll, you can just DearMob iPhone Manager Mac version to delete iPhone photos on Mac without restrictions. How to Delete Photos from iPhone with Photos App? Deleting numerous photos from iPhone by tapping individual pictures in Photos app is tedious, but there is a cinch for who happens to have a Mac computer to remove photos from iPhone on Mac. Step 1. Connect you iPhone to Mac via USB cable and then launch Image Capture on Mac. Step 2. Select your iPhone in Image Capture's Devices column -> choose a destination for your imported images from the Import To pop-up menu . Step 3. Select Other -> click the Import All button at the bottom right of the window and then all the images in your iPhone's Camera Roll will be imported. Step 4. After that, press Command-A to select all the iPhone's images and then click the Delete button -> confirm to delete iPhone pictures when you are asked to confirm that you want to delete your images. Alternatively, you can use iPhoto to import photos to your Mac. Once you click one of these buttons it will ask you if you want to delete the photos from your iPhone once they are imported.